In the age of fake news and of filter bubbles, assessing the quality of information is a compelling issue: it is important for users to understand the quality of the information they consume online. We report on our experiment aimed at understanding if workers from the crowd can be a suitable alternative to experts for information quality assessment. 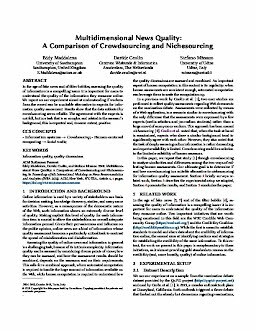 Results show that the data collected by crowdsourcing seem reliable. The agreement with the experts is not full, but in a task that is so complex and related to the assessor’s background, this is expected and, to some extent, positive.